by Sarah - May 5th, 2010. Filed under: General Gardening. Tagged as: espares garden. I’d heard of espares but hadn’t considered them as a option recently when we needed some more strimmer line. I didn’t know they did garden spare parts but they do! And they have quite a range too! and Garden Vacuums. These are the every day items that most of us have at home – and when they break or you need spares then you need to get them quickly and cheaply. Espares items are usually dispatched within 2 business days. This is an impressive list and covers everything in the garage or garden shed for most people! If you’re after strimmer line then they will have it for your machine! You can browse for the machine brand and then the type of search for the model number. If you realise you’ve ordered the wrong part then you can review your basket at checkout and remove any items and replace them with the right one. If you’ve done it completely wrong and need to cancel the order this is possible too. The site is quite flexible for users to find their way around – it shouldn’t take you more than a couple of minutes to hunt down the part you want! My first test order was split into two parts – the first part has arrived safely and with appropriate packaging and a ‘fragile’ sticker to protect it from the worst excesses of the postal system! The delivery note that accompanies it states that the other part is being dispatched separately but their efficient email and tracking system allows me to see this anyway! The note even comes with a sticker with their website address and phone number on so you could stick this into your personal phone book! They also state that if your packaging isn’t new – then it’s because they reuse and recycle packaging which is a great thing for any company to try and do! All cost savings can then be passed on to the customers as Espares have a price match guarantee promise which is well worth looking at. The whole shopping experience at espares is simple and quick. You can buy with various credit card payment methods or you can use your paypal account! And on orders under £6	it’s only £1.49. For orders between £6 and £9.99 it’s £2.49. This is great if you’re only buying one cheap thing then you don’t pay a lot for delivery! They delivery to Europe too and this costs a little more as you could expect £6.95 – and they can deliver to the rest of the world too for this but some orders might cost more, so if you’re outside the EU you should check how much it’ll cost first. 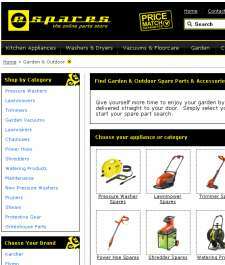 The site is packed with practical help to enable you to replace items easily without fuss or difficulty. It’s a great site that’s got hints, reviews as well as videos.The videos show you how to do things and explain how to get repairs and replacements right first time. Repairing your garden tools and keeping them working with proper brand name spares is just what Espares is great for! Make a note of it today! Overall Espares provides a great service with a huge range of items – all those little things that you could spend hours looking for in a hardware store are all there and easy to find! Make your gardening more eco-friendly by repairing your garden tools!